The Quebec designer Marie Josée Chagnon, under the trade collection Marie-Osée, offers a timeless selection of prêt à porter, evening and wedding dresses. The experience and reputation are transposed in the elegance of the models, the delicacy of the cuts and the quality of the finishing touch added to the clothes. We fall under the spell of her lacy touches and other Victorian details which have shape her notoriety from one collection to the next. 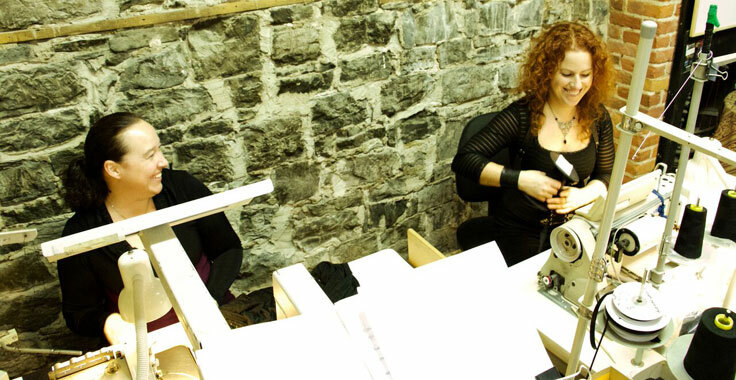 The boutique and the creative studio opened in 2002 on St Jean Street and is now located at 171 St Vallier West in Quebec City.Marie Josée is a graduated design student from the campus Notre Dame de Foy in Quebec City. Lately Marie-Osée has released very innovative creations, starting from T-shirts of your favorite music groups or other social themes, she cuts and adds details to create very feminine dresses, camisoles or vests. During your next visit to Quebec City, drop in at 171 St-Vallier west and visit her unique studio boutique, or contact Marie Josée herself on Facebook, she offers a very personal service to every client, you will be amazed at what she does. To explore the latest creations and exclusive to the boutique clothing line, visit Marie-Osée on Facebook.